The Pentagon's Iraqi Most Wanted "Deck of Death" playing cards was a huge hit with Americans. Newsmax is raising the ante — with the Deck of Weasels, depicting the 54 worst leaders and celebrities who opposed America and were key members of "The United Nations of Weasels." 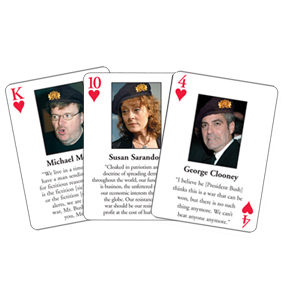 This set of playing and informational cards — which will surely be a collector's item — depicts the enemies of America and Iraq's liberation in a satirical way while revealing the evidence of their hatred — their own quotes against America! No doubt the Deck of Weasels will enrage those included — including Michael Moore, Tim Robbins, Jacques Chirac, Barbra Streisand, Teddy Kennedy, Kofi Annan and many more. You'll laugh out loud looking at the faces of the world's greatest weasels — each wearing the beret of Saddam Hussein's Republican Guard — now dubbed "Saddam's Weasel Brigade." Under each photo is each Weasel's quote revealing his anti-American, pro-Saddam ranting!